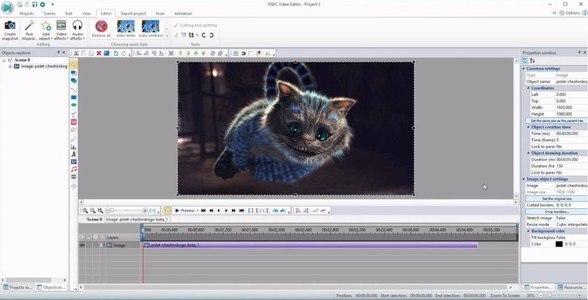 VSDC Free Video Editor is a versatile non-linear video editing program giving you extensive functionality to produce professional quality movies. ✔ Apply visual and audio effects to enhance your videos. Stabilize your videos, use color correction and color blending tools, add professional filters, special FX and choose from over 70 transition effects. ✔ Create high quality videos for YouTube, Facebook, Instagram, Twitter and Vimeo. Upload videos directly to Youtube and share your creativity with the world. ✔ Chroma-key (aka Green Screen) allowing you to remove backgrounds. ✔ Capture and edit video from your desktop, webcam, video tuner, and IP camera. ✔ Integrated DVD burner to create custom DVD and Blu-ray discs. ✔ Built-in device profiles ensures video output is compatibility with specific multimedia devices, including Smartphones, tablets, DVD players, MP3/MP4 Players, and gaming consoles. Video: MKV, AVI, MP4, MPG, WMV, 3GP, FLV, etc. Process up to 4K Ultra HD. Audio: MP3, FLAC, M4A, WAV, WMA, PCM, OGG, AAC, AMR, etc. Image: JPG, PNG, PSD, BMP, ICO, TIFF, etc.